In the world of cancer one of the most impactful things that can take place is the earliest possible discovery that a cancer or precancerous condition is present. Early discovery yields less morbid treatments, and the early staging of the disease that occurs as a result, often improves long-term outcomes. Like in other cancers, this also applies to those cancers of the oral environment. Today in America, oral cancers are found as late stage disease in the majority of cases, and the opportunity of early discovery is not being capitalized on. 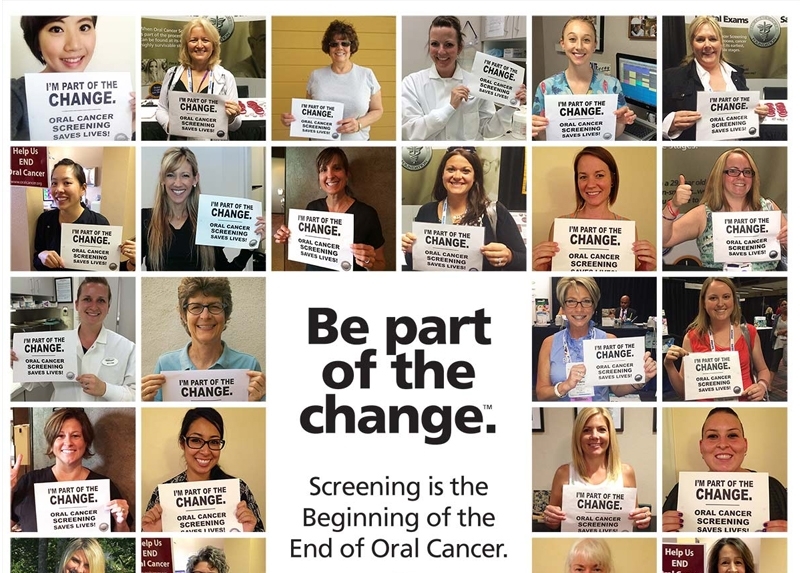 With more than 60% of the American population seeing a dental professional each year (ADA data), and virtually all of them receiving training on oral cancer during their education to become dental professionals, we should be able to improve this situation. There are many things that must change to reduce the impact of this disease, but few are as important as early discovery of suspicious tissues, and unusual signs and symptoms. Another change that would benefit this situation, is self discovery. It happens through an increased awareness in American’s knowledge of the disease itself, and their learning the early warning signs they should be looking for on their own. In other cancers such as breast, self-discovery by women doing their own breast exams has greatly improved the discovery of early stage problems. We need to change the lack of significant funding the rate at which research is being done in many aspects of oral cancer…. and there is more. Some of this can happen quickly, but the problem of late discovery of the disease, MUST CHANGE. One group of individuals is uniquely positioned to be in the forefront of the early discovery paradigm; members of the dental hygiene community. With over 150,000 hygienists working in communities across the US, they have the numbers to have an impact. With a hygiene professional seeing approximately 10 patients per day, they see a huge segment of the American population in their practice every year. Most importantly, they spend a large amount of time at each patient visit looking at the soft tissues of the oral cavity, where the early manifestations of oral cancer occur. Lastly, their training gives then an existing skill set to identify suspect tissues, and refer them upwards in the dental community for confirmation (general dentistry), biopsy (oral surgeons and periodontists), histopathology and diagnosis (oral pathologists). 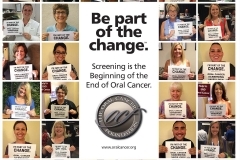 The foundation is developing a relationship with the dental hygiene community on an individual level, and through their national, state, and and regional organizations to become actively engaged in oral cancer screening. Note that screening involves the discovery of suspect tissues, not diagnosis of disease. We believe that as our partners in this quest, RDH’s will become the leading edge of early discovery, and the paradigm of late stage finding of oral cancers with its inherent negative consequences for the patient, will be changed. On an individual level we are asking RDH’s to “be part of the change®” by incorporating the very simple visual and tactile screening into the hygiene patients visits. In 5 minutes the opportunity to change the course of an individual’s life, can take place. Tens of thousands of screenings a year will have an impact. 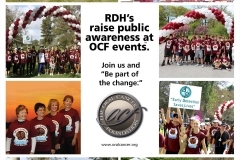 The word about this campaign is spreading through the RDH community, and they are actively helping OCF spread the idea. 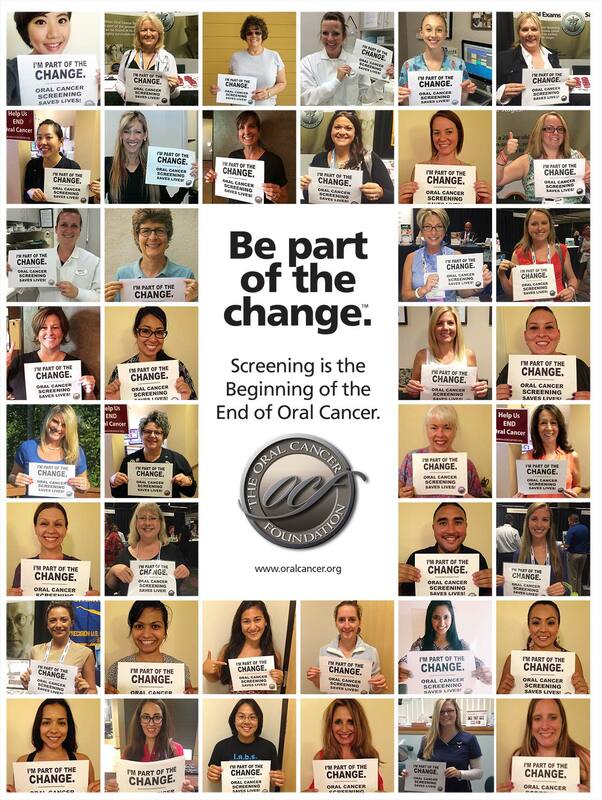 Hundreds of RDH’s have printed out our simple message, “I’m part of the change – oral cancer screening saves lives,” taken a picture of themselves holding up their pledge, and allowed OCF to post their images on social media pages like Facebook, and use them in ads appearing in national publications like RDH magazine. The viral spread of the idea through this simple mechanism is starting to snowball. Clearly being “part of the change” involves staying scientifically current on what we know about the disease and screening for it. The foundation is also supporting RDH education through the sponsorship of lecturers at core RDH meetings and events, to ensure that they have the most accurate and contemporaneous information available, and seeing that vetted articles appear in publications that reach the hygiene community. Even OCF’s founder and executive director, Brian Hill is out at state hygiene meetings lecturing and engaging in group discussions about topics as wide ranging as the implications of HPV in oral cancers, to the opportunities that vaccination of the next generation of Americans provides. 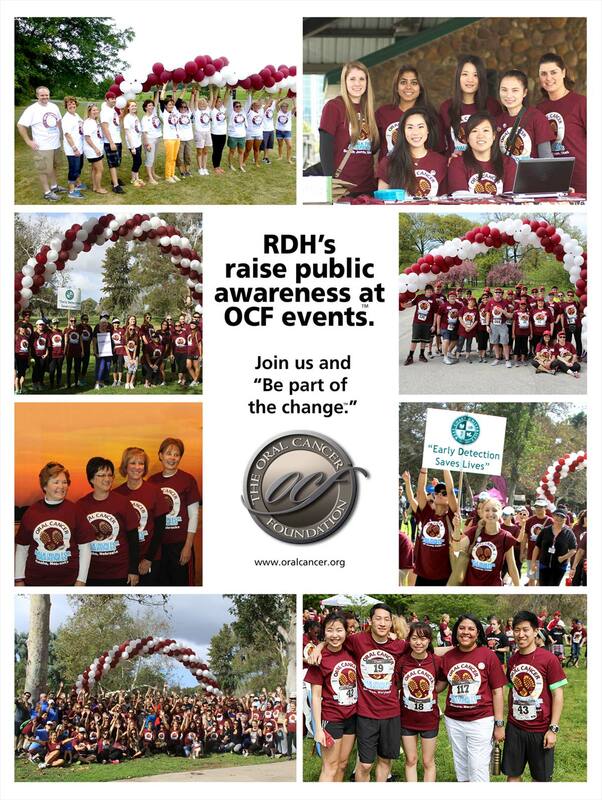 Also of importance in this relationship between the RDH community and OCF is their support of raising public awareness of oral cancers, the early signs and symptoms of one developing, and the risk factors that might bring this into someone’s life. They do this during conversations with patients in their offices every day, but they also do it in very visible ways. RDH’s are some of the foundation’s biggest supporters at our national walk/run awareness events conducted around the country. Both as volunteer organizers of the events themselves in many cases, and as attendees at the events their presence has a huge impact. The foundation is enthusiastic and grateful for the relationship that we have with the oral hygiene community, and pleased that they have chosen to engage in this fight against a disease that is taking far too many lives in the US each year. They are an important “part of the change®” that is taking place in bringing this disease down from its high ranking as a killer. Take a well lit photo with you holding the sign. Special thanks to our strategic partners for 2016.